One of the Rules in my new e-book, Lose Weight the Lazy Way: 25 Rules to Success (http://lazygirlz.net/e-book/) is “Don’t Weigh Yourself” and I go into it some detail. But here, I’ll share a few thoughts about why I hate weighing myself. First of all, in the book, I advocate a more sane way of keeping track of your weight loss success, and that is seeing how the waistband feels on your favorite pair of jeans. It is the inches that count, not pounds per se. In fact, I only allow myself to be weighed once a year at the doctor for medical reasons. Now, if you are under a doctor’s care and ordered to weigh yourself, then this blog post is not for you. For the rest of you, please read on. Weighing yourself as the primary measure of your weight loss success stinks for the simple reason that weight fluctuates naturally, not only day to day, but within a single day. In the deep, dark past, I have been on diets where I faithfully measured my weight every single day…and it drove me nuts. It’s just entirely too depressing when you think you’ve been good at your eating habits but it doesn’t show on the scale, or worse, your weight goes up, not down! There’s always a bit of the yo-yo effect when you rely on the scale. I say stop being a slave to the scale forever and ever. The idea that some inanimate object could be the source of so much angst among women is simply preposterous. My issues with weight fluctuation were the most acute during my PMS days. I would literally fluctuate up five pounds every single month exactly one week before my cycle. It was obviously water weight and hormonally induced and a source of ongoing misery for years. At least I don’t have to deal with PMS anymore! But hormones, both pre- and post-menopause, are a major factor in weight gain as we know. 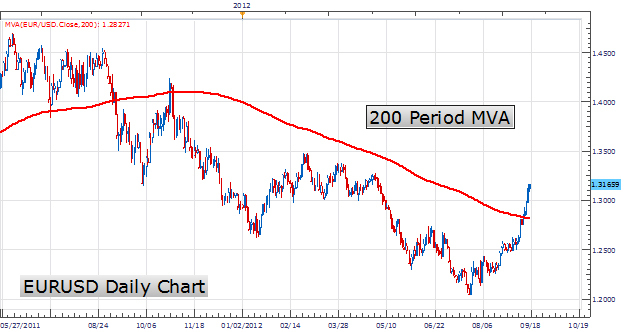 I’ll post a picture of a moving average here. As you can see, all those crazy, insanity-provoking ups and downs are all smoothed out by the downward trend of the moving average. That’s all that counts. Now don’t think for a second, I am advocating that anyone use advanced charting to track their weight. No, no, no! So, relax. If you are a person that wants to weigh yourself occasionally, don’t ever beat yourself over the normal ups and downs we all go through with weight loss, because all that matters is the trend. If in three months you are lower than you are now, congratulations – that’s all you need to know to know you are on the right track. And if you are like me, you’ll just use the jeans method…because unlike that rotten scale, jeans never lie!